The Physician Quality Reporting System, otherwise known as PQRS, is a voluntary reporting program that provides incentive payments to eligible professionals (EPs) who report data on quality measures within their practice. This program promotes the opportunity for EPs to assess and report on the overall quality of care they are providing to patients, helping ensure that patients are getting the highest level of care possible. The new year of 2015 has brought with it the beginning of negative payment adjustments for those who are not participating in PQRS. It is imperative that your practice begins reporting data now, if you're not already doing so, in order to avoid future penalties for not meeting the program's requirements. By understanding PQRS and successfully reporting, you give your practice the chance to improve its workflow, efficiency, and quality of care. PQRS is a voluntary program and is separate from the Medicare and Medicaid Incentive Programs. You must successfully report on at least 50% of eligible insurances (Medicare Part B PFS) within a 12 month period. There are 5 different options for reporting (including direct from your certified EHR). If your practice is able to successfully report in the 2015 year with the PQRS program you will avoid negative payment adjustments in 2017. When reporting PQRS data it must all come from one application. If you must switch applications mid-year, you will need to merge the data via a registry before submitting to the CMS. 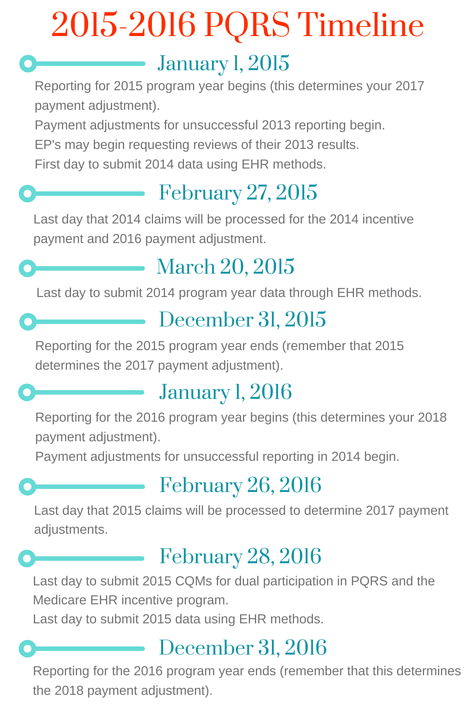 March 20th, 2015 is the last day to submit 2014 program year data through EHR methods. Unsuccessful reporting in 2015 and the following years, results in a 2% downward adjustment on Medicare in 2017 and the following years respectively. If you're using a certified EHR software you may document all patient care, visit, and other related patient information directly through the EHR in order to submit your quality measures. Your must register for an Individuals Authorized Access to CMS Computer Services account (IACS). Once the account is created, you can then submit data directly from your optometry office software, and the portal in IACS can then generate and upload reports for you. Although the data is now passing through a vendor, your EHR software still must be certified in order to use this method of reporting. You’re still responsible for documenting all patient care, visit, and related information into the EHR, but a vendor is the one truly responsible for submitting your data to the CMS through specified formats on your practice’s behalf. If your practice decides to report through Medicare Part B Claims, you must report at least 9 measures, covering at least 3 of the National Quality Strategy (NQS) domains, as well as report 50% of your Medicare Part B FFS patients seen during the reporting period. This method requires your practice to work directly with the participating registry for their specific information on how to submit your data. Qualified registries collect clinical quality data directly from claims, web-based tools, practice management systems, and/or EHR systems. It is important to note that qualified registries are responsible for helping calculate and organize quality measures data in specific CMS format, but they do not submit it. A Qualified Clinical Data Registry (QCDR) collects and submits PQRS data on behalf of your practice. These registries are all CMS approved, and they track your medical data to highlight and discover ways to improve the quality of care your practice provides to patients. Don’t fall behind! Begin reporting your PQRS data today and avoid future penalties. And, subscribe to the VisionWeb blog to learn even more about PQRS and other Incentive Programs!